It was no ordinary last day of school before the summer break in this First Nation. When former Prime Minister Paul Martin, Margaret Norrie McCain and other honoured guests pulled up at Hillside elementary school, they were welcomed by students, many wearing their traditional regalia. The day was a celebration of the students’ success and a thank you to the Martin Aboriginal Initiative and the Margaret and Wallace McCain Family Foundation for supporting integrated early years programming and culturally-based literacy instruction. Over the 5-year project the students’ academic achievement scores in reading and writing increased significantly – Hillside students now score at or beyond the provincial average. The most important accomplishment, said Chief Tom Bressett, was the “sense of accomplishment the initiative has given to the community.”. 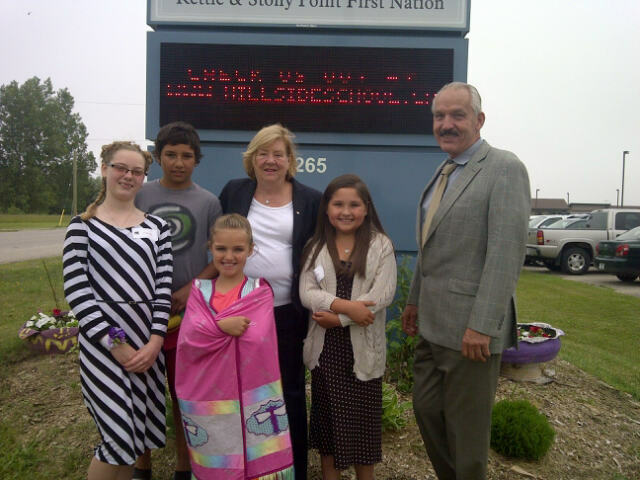 The Honourable Margaret Norrie McCain with Dr. Carl Corter and students from Hillside Elementary School on the Kettle and Stoney Point First Nations. Margaret McCain joins Larry Tanenbaum, Larry Pathy, and the Rte. 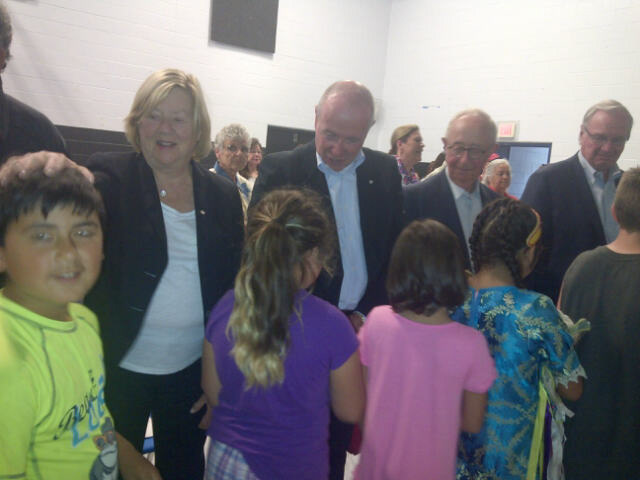 Honourable Paul Martin to greet the elders, students and staff at Hillside Aboriginal Headstart and School for a “Celebration of Literacy”.